Part two of my Paris Guide includes hip hotels, mouthwatering markets and splendid day trips to take your trip from touristy to transcendent. Whether you’ve been once, ten times, or never, there’s always a reason to pine for Paris. Areas like Montmartre, with its narrow roads winding up the hillside, and Île Saint Louis, with its spectacular views of the Seine and Notre Dame, are every bit as charming and beautiful in person as you might imagine. The slower paced Parisian lifestyle is also enviable. People truly appreciate quality and craftsmanship in every element of their daily lives whether it’s the baguette they pick up in the morning or a tailored blouse they purchase from a boutique. 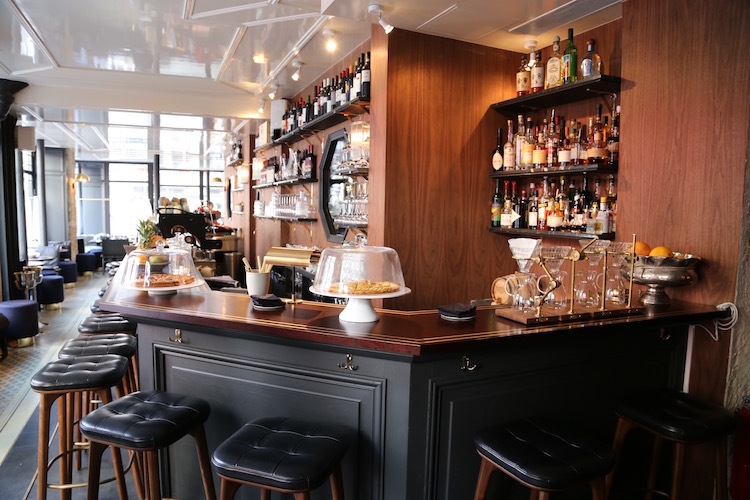 If you’re willing to venture outside the center of Paris to arrondissements such as the 10th and 11th, you will see the natural wine bars, avant-garde bistros and artsy boutiques frequented by young Parisians. Part two of my Paris guide is designed to help make your dreams of visiting and revisiting the city a reality. Here’s the Travelproper-approved list of hotels markets, day trips and events that will take your Paris journey beyond the typical tourist attractions. A room with a view at the Grand Pigalle in Paris. Believe it or not, there are decent accommodations to be found for under $200 in Paris. The best ones are understandably quite popular, so book in advance. This is a wise choice for those who like aspects of a hostel stay, like a youthful scene and communal spaces, but would prefer not to share a room with strangers. Starting at just €78 a night, private rooms are very reasonably priced. If you’re fine with sharing, you can really save some money. Beds start at €17 a night. Generator Hostel is located in the 11th arrondissement close to Parc des Buttes Chaumont. There are plenty of good restaurants and coffee shops nearby. 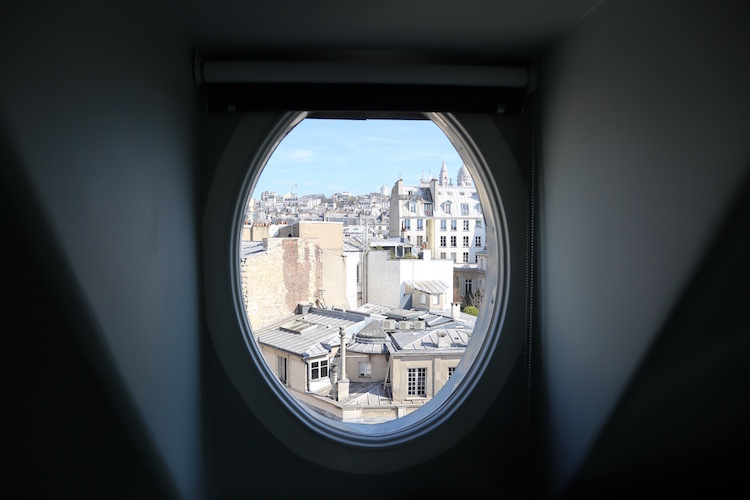 The 9th-floor rooftop bar with views of Montmartre and Sacré-Coeur is no typical hostel hangout. The Grand Pigalle features interiors designed by Maison & Objet Designer of the Year Dorothée Meilichzon. Experimental Group, the cocktail gurus behind many of Paris’s best bars as well as spots in London and New York, opened this hotel in the 9th. Cocktails do play a pivotal roll. The hotel bar serves excellent straightforward drinks and premade cocktails are available in guest rooms. Look closely at the carpet found throughout the upper floors, those are tiny martini glasses in the pattern. Guestrooms have large windows and views onto Rue Frochot. This is a popular nightlife area and the streets can get loud late at night. The bar at the Grand Pigalle serves some of the best cocktails in Paris. This lovely locally owned hotel is just a stone’s throw from Place des Vosges. Rooms are small, but tidy with modern furnishings. They also serve a nice breakfast. Hoxton’s properties in London and Amsterdam offer a cool scene and comfortable guestrooms, but at a fraction of the cost of the typical European luxury hotel. The Paris Hoxton is no exception. Shoebox rooms start at just 99 euros a night. Located in an 18th-century residence, guestrooms have parquet floors and white subway tile bathrooms. The lobby is a space for guests and locals alike with the bustling brasserie Rivié and the cocktail bar Jacques’. Located in the 2nd, Hoxton Paris is walking distance to the Palais Royal, the Louvre and Les Halles. This hipster hangout near Père Lachaise Cemetary (where Jim Morrison’s tomb is located) is a little ways away from the tourist sites, but that’s part of the appeal. If you stay here, you’ll get to explore the burgeoning 20th arrondissement and you’re very near the trendy 11th frequented by young Parisians and teaming with cool bistros, bars and boutiques. Mama Shelter’s eateries, a Neapolitan-style pizza restaurant and a cocktail bar with frequent live music, become lively hangouts for locals on weekends. 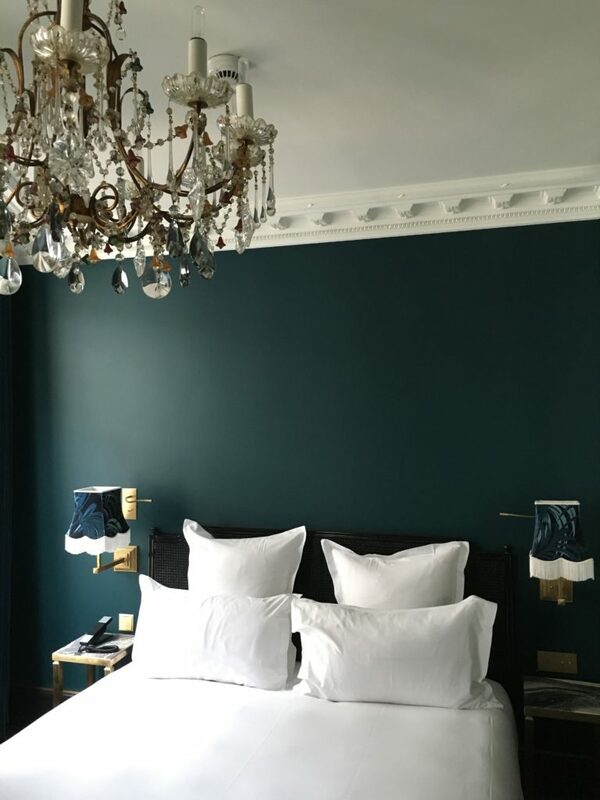 If you’re able to spend a little bit more, you are spoiled for choice when it comes to beautifully designed boutique hotels with good locations in Paris. These options fall in the $200-$400 a night range. Hôtel du Petit Moulin used to be a boulangerie. 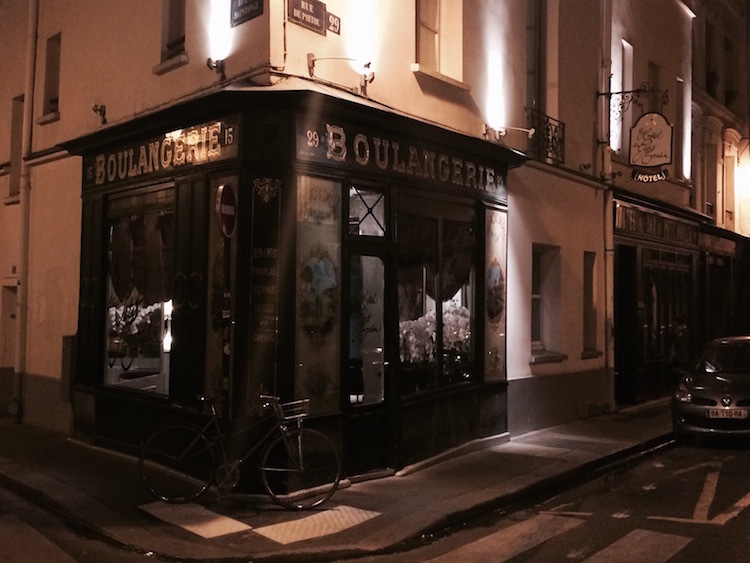 This building has the distinction of being Paris’s first bakery. According to the website, it’s where the writer Victor Hugo would buy his baguette. A listed historic monument, the boulangerie frontage remains and it sets the tone for the quirky world of designer Christian Lacroix that you enter when you stay here. Lacroix designed the 16 rooms and one junior suite, and each room is different. I like the Marais-inspired room with Toile de Jouy wallpaper. Bathrooms feature Venetian mirrors and slate finishes. The location puts you right in the center of the fashionable Upper Marais. 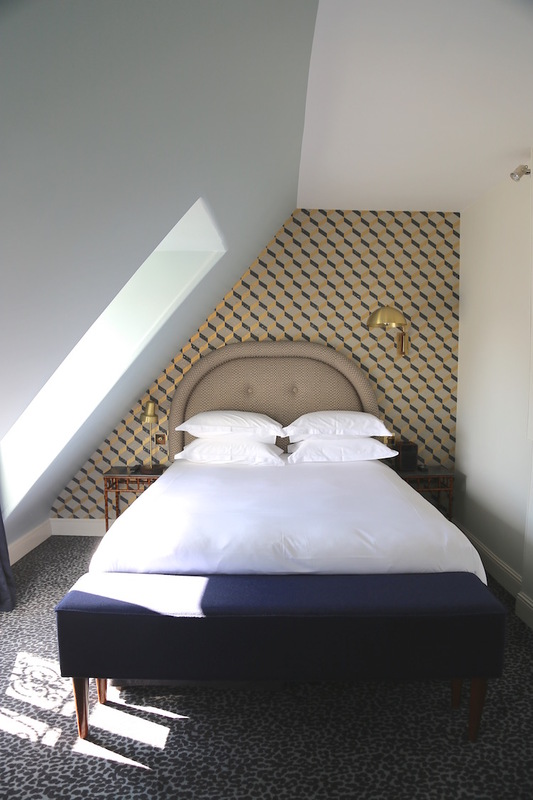 Also in the Upper Marais, Hotel Jules and Jim offers a more contemporary ambiance. While the frame of the 18th-century building remains, everything else is new construction. Guestrooms feature wooden bedframes, tile showers and crisp white sheets. There’s a nice surprise within the hotel, a courtyard with a vertical garden and an adjacent bar serving specialty cocktails and Veuve Clicquot Champagne. Les Bains was a thermal bathhouse during the Belle Époque then in the late 70s, it became a legendary nightclub. It has entered a new phase as a luxury boutique hotel. It’s the type of place where you can find something going on morning, noon and night. Beautiful public spaces include a striking bar beneath a rippling red lacquer ceiling, a restaurant popular with locals and guests and a club hosting live shows, concerts and events. There’s also a wellness spa with a swimming pool and hammam. A guest room at the Providence Paris. The House of Hackney velvet wallpaper, claw foot bathtubs and black lacquered cocktail bars in each room set the tone in this discreet hotel in the 10th arrondissement. There’s plenty to draw you outside of the comfy confines of your room. The Providence has a buzzy bar, excellent wood-fired grill restaurant and rooftop terrace. The location makes exploring the trendy boutiques and restaurants of the Upper Marais and Canal Saint-Martin easy. Food and cocktail connoisseurs will appreciate the dessert trolley from Pâtisserie des Rêves, room service featuring a lobster sandwich on brioche and the copper shaker and cocktail recipes in each room that allow guests to explore their inner mixologist. Guestroom prices are a little high (around $400 a night) for a boutique hotel, but with an indoor swimming pool, a spa and a gastronomic restaurant, Le Roch Hotel & Spa offers the amenities of a five-star hotel. Sarah Lavoine designed the interiors and the lobby feels like a library with bookshelves and a fireplace. The 37-guestrooms feel Art Deco inspired. The CODAGE Spa offers personalized skin care treatments. One of the main reasons you should consider booking a room at this left bank address is the restaurant. Midweek guests are guaranteed a spot at the idyllic French bistro where chef Yves Camdebord prepares a flawless tasting menu. The father of bistronomy is also the owner of the hotel. Cozy Rooms feature leopard print furnishings and wood beamed ceilings. Camdebord’s L’Avant Comptoir, a stand-up tapas style restaurant and L’Avant Comptoir de La Mer, an oyster bar, are also worth trying. This luxury hotel looking out onto the Jardins de Champs-Élysées feels more like a private mansion than a hotel. It’s still been awarded Palace status because it offers luxury amenities like an indoor swimming pool, a spa, a two Michelin star restaurant and concierge services. Interiors designed by Jacques Garcia are striking. The bar and lobby lounge, all red and gold, recall the Second Empire style found in the Napoleon III apartments at the Louvre. These more sultry spaces provide a striking contrast to the 26 suites and 14 guest rooms. Italian silk walls, herringbone oak parquet floors and Carrera and Turquin blue marble bathrooms keep the spacious guest rooms light and bright. The beautiful art nouveau-inspired headboards are by Prelle in Lyon. Many of the scenes from Midnight in Paris were filmed at this grand dame on Rue du Faubourg Saint-Honoré. The Panoramic Suite, with views of Sacré-Coeur, Montmartre and the Opera Garnier, is where Rachel McAdams and Owen Wilson’s characters stayed in the film and it looks just as it did on screen with its purple and white floral bedspread and drapes. That room costs a pretty penny, but all the guest rooms at Le Bristol are beautifully decorated with antique mirrors, Louis XV furnishings and works of art from the owner’s personal collection. Le Bristol even employs its own team of artisans who refurbish the antique furnishings regularly so they stay in tip-top condition. 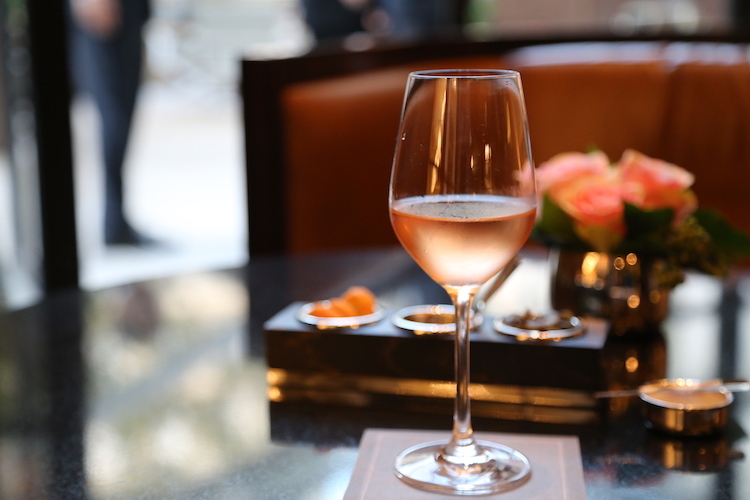 Le Bristol’s three Michelin star restaurant Epicure is one of the best in Paris. When you step into Le Royal Monceau, you immediately sense that this hotel is different from the other “Palaces” in Paris. More playful and irreverent, the hotel gift shop is an art bookshop, there’s a movie theater off of the lobby serving popcorn and champagne and macaron-master Pierre Hermé is the pastry chef. Philippe Stark is responsible for the interior design and he took inspiration from an artist’s work studio in the guest rooms featuring mirrored surfaces, contemporary artworks and guitars. Le Royal Monceau’s spa My Blend by Clarins is ethereal and relaxing. Painted white from head to toe, it sports a 23-meter swimming pool, the longest in Paris,. A skylight floods the space with natural light. The spa offers day-long detox programs, rebalancing massages and anti-aging treatments. Health and wellness is incorporated into other aspects of the hotel as well. The restaurant La Cuisine features a detox-friendly breakfast. Located North of the Arc de Triomphe, the hotel does feel a little bit removed from the center of the city. This could be good or bad depending on what you’re looking for. 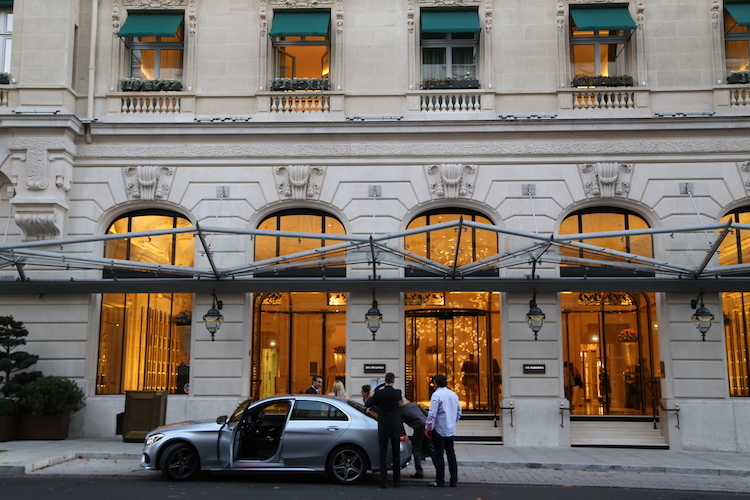 The Peninsula Paris reopened in 2014 following a renovation. This storied property has had many lives. Queen Isabella II of Spain owned a palace on the site in the 1800s. Construction on a hotel began in the early 1900s and the Hotel Majestic opened in 1908. The Germans occupied the hotel during WWII. Following the war, it became a UNESCO Headquarters. The Paris Peace Accords, ending the Vietnam War, were signed in 1973 in what is today Bar Kléber. Peninsula Hotels acquired the property in 2008 and it took six years of design, planning, construction and refurbishment to turn in into the Peninsula Paris. Every corner of this 200-room hotel is impressive from the lobby with hand-applied gold leaf to the trompe l’oeil frescoes in the cigar lounge. Guest rooms are more contemporary with a neutral color scheme and high tech tablets that control lights, temperature and room service. The rooftop L’Oiseau Blanc restaurant offers well-balanced cocktails and a jaw-dropping view of the Eiffel Tower. Bar Kléber is where the Paris Peace Accords were signed in 1973. This beautiful hotel used to be the palace of Prince Roland Bonaparte, Napoleon’s nephew. Grand spaces, like the former drawing room, have been immaculately restored and are now used as event space. The hotel manages to feel intimate, but it has everything you could possibly want in a luxury hotel—an indoor pool, a spa, and three excellent restaurants, including one of the only Michelin-starred Chinese restaurants in the world. Guest rooms feature contemporary furnishings but the Imperial Suite, Bonaparte’s former private apartment, is decorated in period style. All blue and gold and decorated with Chinese vases, it’s one of the most beautiful hotel suites in the city. While expensive, the Ritz is extremely family friendly. They will make sure your children’s every need is met. The timeless Ritz Paris reopened in June 2016 after nearly four years of restoration and renovation. An homage to French art de vivre, the hand painted Limoges porcelain service used since the hotel’s opening in 1898 still graces the tables in the two Michelin starred L’Espadon restaurant and guest rooms, refurbished by Thierry Despont, have an unapologetic classic French feel. Think soft pastel hues, tulip lamps and Louis XVI style furnishings. Tucked off Hall Vendôme, the Salon Proust offers oak paneling and a crackling fire. The spongy madeleines served as part of the afternoon tea à la Française are a nod to author Marcel Proust who held court at the Ritz and immortalized the French cakes in his novel “In Search of Lost Time.” The Bar Hemingway serves some of the most expensive cocktails in the world, but the casual atmosphere and friendly service make it a worthwhile splurge. 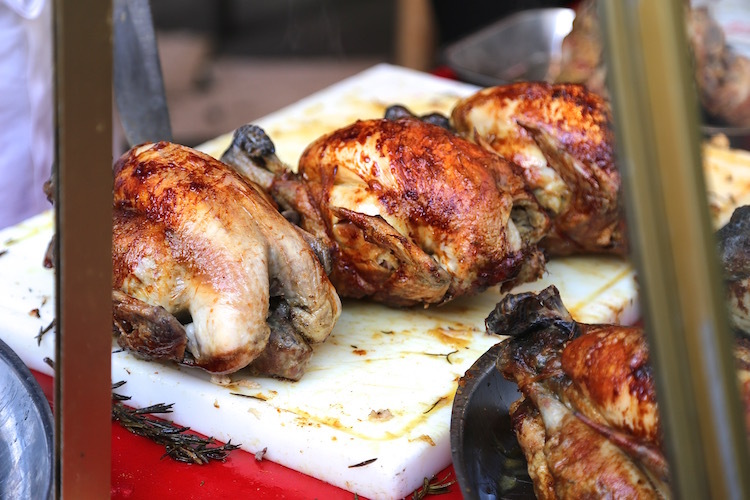 The Chicken Lady sells the best birds in Marché Bastille. This massive market near the Bastille takes place every Sunday. Must visit vendors include the Chicken Lady for spatchcocked birds flavored with ingredients like honey and ginger, the vegetarian falafel stand for tomato and herb wraps and any of the organic fruit and vegetable purveyors for excellent produce. 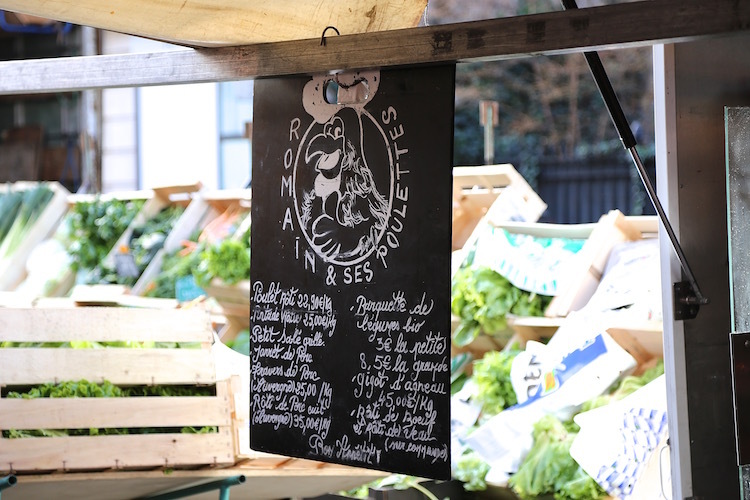 Everything is organic at Marché Bio Raspail. This all-organic market in the chichi 6th has higher prices than many of the other markets in Paris, but everything, from the fruits and vegetables to the takeaway food, is excellent. 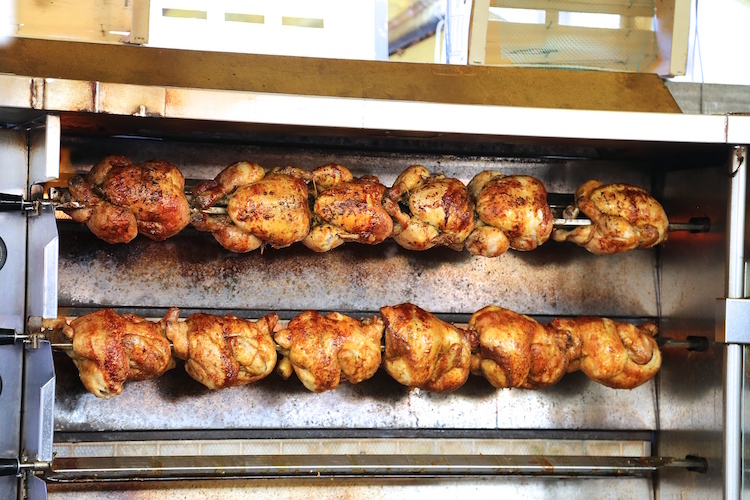 Look for Poulet de Bresse, fresh baked English muffins and the most incredible veggie paella in the land. Poulet Bresse at Marché Bio Raspail. Located in the somewhat off-the-tourist-track 12th, this market has a local feel and the prices are lower than many of the others. The organic fruit and vegetable stands are a highlight and the covered market has vendors selling roast chicken as well as a craft beer shop. The market runs along Rue d’Aligre and the street is lined with good restaurants. The butcher and restaurant Les Provinces sells some of the best meat in the city. The oldest market in Paris is more of a gourmet food hall these days where you can choose between Jamaican, Moroccan and Japanese cuisine. It’s a wonderful place to go for lunch, but keep in mind, each vendor is like a “mini restaurant” and sitting in its space with food from another vendor is typically frowned upon. The market does have a fishmonger, two fruit and vegetable stands and a florist. The famous horseshoe staircase welcomes visitors to Fontainebleau. This palace 45 minutes south of Paris is overshadowed by Versailles, but it actually has a much deeper history. 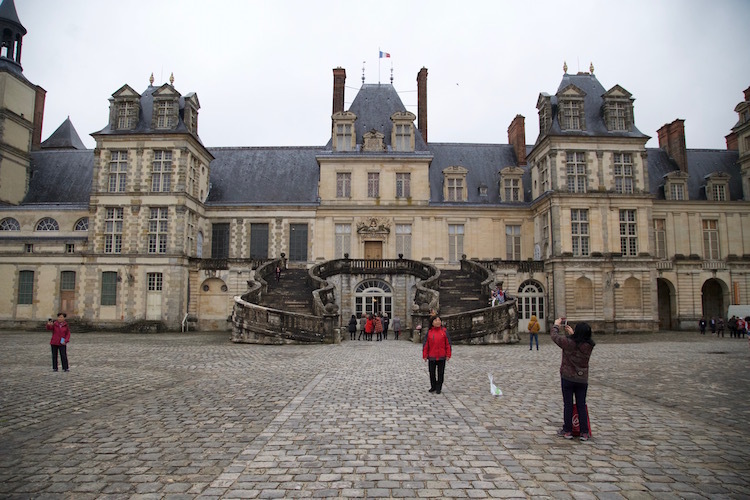 Fontainebleau dates back to the 12th century, but much of what you see today was built in the 1500s when François I renovated the palace. Fraçois is credited with bringing the Renaissance and Leonardo da Vinci to France. The gallery that bears his name with allegorical frescos by Rosso Fiorentino, white stucco figures and gold leaf is a highlight. Marie Antoinette’s jewel box-like Turkish Boudoir and the Imperial Theater of Napoleon III are beautiful, but it’s only possible to visit if you pay for a guided tour. From Gare de Lyon, take a Transilien train for either Montargis Sens, Montereau or Laroche-Migennes, getting off at Fontainebleau-Avon station. Take the Ligne 1 bus heading for Les Lilas and get off at the Château stop. The main reason people visit this village in Normandy is to see the home and gardens where Claude Monet painted for over 40 years. The entire town seems to capitalize on its ties to the Impressionist painter. There’s a wonderful Museum of Impressionism and the main road is lined with art galleries. During Monet’s lifetime, the town became a pilgrimage point for artists hoping to meet and study with the famed painter. At Fondation Claude Monet, visitors can go inside Monet’s country home with Kelly green shutters and a sunny yellow dining room decorated with Japanese prints and stroll around the Water Garden. The water lily topped-pond surrounded by bamboo forest starred in Monet’s most famous paintings. From Paris take the train from Gare Saint Lazare to Gare de Vernon. It takes 45 minutes. From here you can walk or ride a bike to Giverny, it’s 7 km and bike rentals are available in front of Vernon Station. Shuttle buses from Vernon to Giverny also leave 15 minutes after each train arrives. Josephine and Napoleon Bonaparte’s château nine miles west of Paris may be the most overlooked tourist site in Île de France. This means you should definitely go because it’s fabulous and never very crowded. The first thing you need to understand about Malmaison is that it really was Josephine’s domain. The future Empress reportedly purchased it in 1799 without telling Napoleon. She lived there permanently after their divorce in 1809. She died there just five years later. Josephine’s soul emanates from every corner, including the elegant dining room with black and white floor tiles (Josephine was a legendary entertainer) to the gardens where rare roses still bloom. A passionate botanist, during her time at Malmaison, Josephine grew 250 varieties of roses. She also had a greenhouse where she cultivated nearly 200 plants in France for the first time. Napoleon’s presence can be felt in the masculine library with arched ceilings and in his military tent-inspired bedroom. Take a moment to examine the family tree in the stairwell. The royal families of Belgium, Sweden, Norway, and Denmark are all Josephine’s descendants. To get to Malmaison take the RER A train to “La Defense,” then take Bus 258 and get off at “Le Chateau.” Another option is to take the RER to Rueil-Malmaison, but it’s about a mile walk to the chateau. Louis XIV’s Superintendent of Finances, Nicolas Fouquet, built this stunning château outside Paris in the 17th century. After attending a lavish party there, Louis XIV was reportedly so jealous he commissioned the architect, painter, and landscaper to create Versailles and he had Fouquet arrested and thrown in jail for embezzling money. Fouquet died in prison in 1680, but the Baroque château endures. For an extra three euros, you can climb into Vaux-le-Vicomte’s dome for a spectacular view of the grounds. The best part about visiting is strolling the one-and-a-half-mile-long garden designed by André le Nôtre, which reveals canals, grottos, and other hidden treasures as you meander through. Sill privately owned, several popular films have been shot at the château including The Man in the Iron Mask and The Pink Panther. Vaux-le-Vicomte is at its most magical on Saturdays from May to October when 2,000 candles illuminate the castle and the gardens and it stays open until midnight. Picnics are allowed on the grassy lawn at the back of the property. Vaux-le-Vicomte would probably be more popular if it was easier to get to. From Paris Gare de l’Est, take the direct train Line P in the direction of Provins. Get off at the Verneuil l’Etang train station. Direct trains leave every 60 minutes and it’s a 35-minute trip. At the station, there is a “Châteaubus” shuttle that picks visitors up and takes them to the château. It’s in front of the train station exit and is cash only. Check the Vaux-le-Vicomte website for latest information on prices and to see if the shuttle is running on your desired date. For two guides based on my favorite French kings go here. 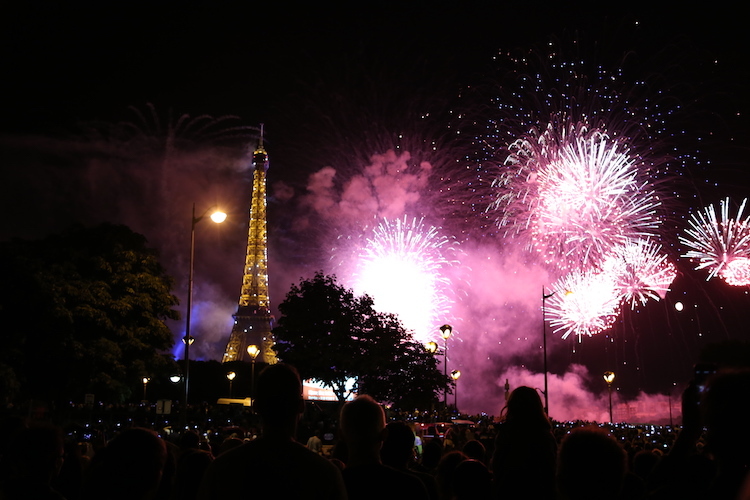 The annual Bastille Day fireworks display incorporates the Eiffel Tower. The French equivalent of the 4th of July takes place each July 14th. The national holiday celebrates the Storming of the Bastille on July 14, 1789, a turning point in the French Revolution. While many businesses are closed, it’s still a fun day to be in Paris. There’s a military parade in the morning on the Champs-Élysées and a firework display at the Eiffel Tower after the sun goes down. On the longest day of the year, Paris becomes one big live music venue with free outdoor concerts taking place throughout the city. Restaurants join in the fun by holding block party-like celebrations where small bites and beverages are sold outdoors. Fête de la Musique takes place June 21rst, the summer solstice, and the line-up for the upcoming festival can be found here. 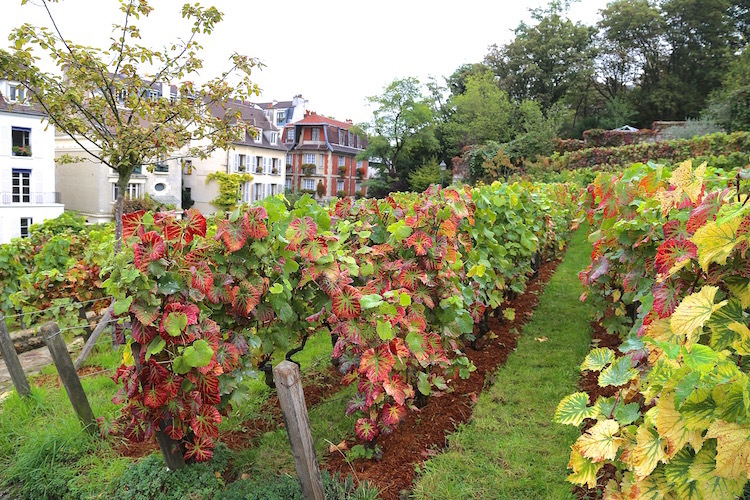 This small plot on Montmartre is one of the world’s most exclusive vineyards. Paris’s most famous butte, topped by the Byzantine Sacré-Coeur church, was once covered in vines. One vineyard still occupies a spot on the back of the hillside and this annual festival celebrates the release of its vintage as well as French food and wine. The narrow streets of Montmartre are filled with vendors selling nougat, foie gras-filled sandwiches and escargot. The festival is organized by region, so make the rounds. For more on what to eat, click here. 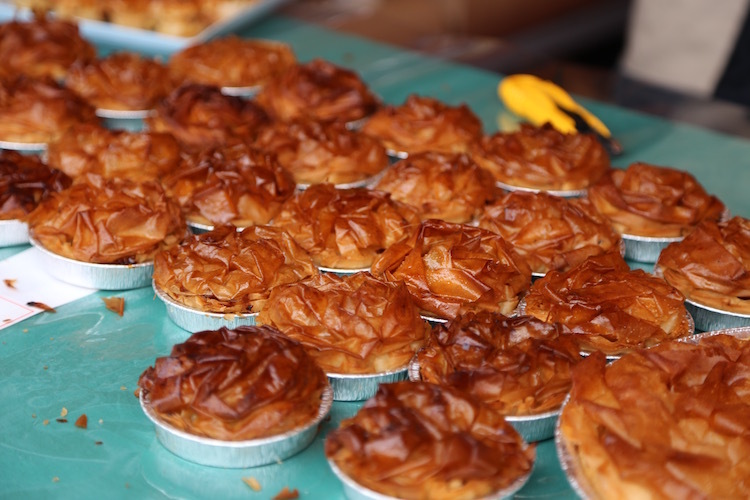 The food is delicious at the Montmartre Harvest Festival. During Journées Européennes du Patrimoine, European Heritage Days, it is possible to visit many sites that are typically closed to the public such as the Hôtel de Bourvellais in Place Vendôme where Chancellors have lived since the 18th century and the library of the Hôtel de Sens, a medieval mansion in the Marais. European Heritage Days take place for two days each September. 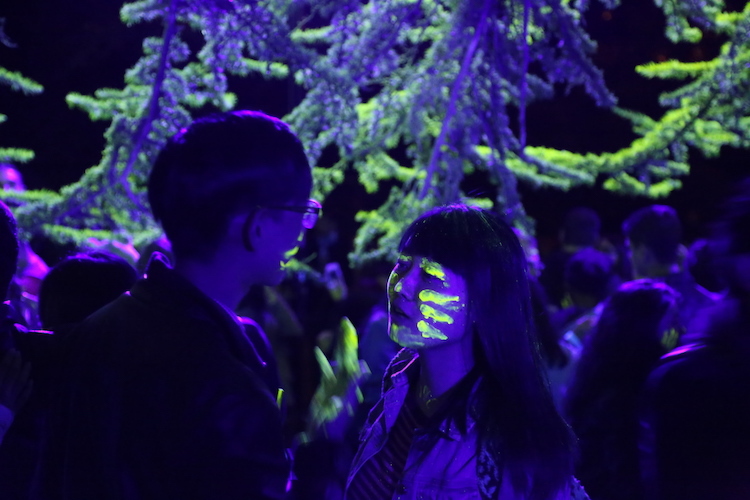 An interactive exhibition at Nuit Blanche. This all-night arts festival includes public art throughout the city. There are interactive performances, light projections on buildings and installations in many of Paris’s most beautiful buildings. Check here for the lineup and know lines can get long. This International Agriculture Show will make your head spin. In late February, early March, the massive expo center at Porte Versailles becomes a showcase for France’s heritage livestock, heirloom fruits and vegetables and gourmet food products. It’s organized by zone. There’s an exhibition hall devoted to horses, visitors can see the different breeds, purchase equipment and even watch an equestrian show; one devoted to cats and dogs; a vegetable crops and related sectors zone where the public can learn about the latest trends in gardening; and a massive gastronomical zone, where every region of France is represented and vendors sell wine, cheese, prepared foods and baked goods. If you want to know what you’re getting into, watch the film Saint Amor. Saut Hermès is one of the most beautiful sporting events. While today it’s more well known for handbags and scarves, the French luxury brand Hérmes began as a saddle maker in the 1800s. It still makes the finest riding equipment on the market. 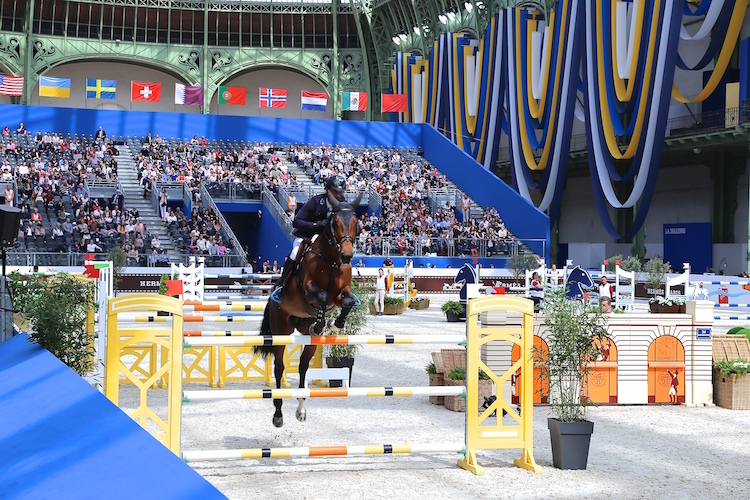 To honor its origins, Hérmes sponsors a horse jumping competition each year at the Grand Palais called the Saut Hermès. The competition that takes place each spring is both adrenaline pumping and aesthetically pleasing. Many of the world’s best riders participate and there’s an equestrian acrobatic show each evening of the competition. Want to know where to eat, drink and shop? Check out Part Un of my Paris Guide here. Dreaming of a move to Paris? Here’s my Step by Step Guide.